Constant values and quoted strings (string literals) will get modified (mangled). Constants get renamed to end in "_mangled", and a new computed property is added that fetches the renamed constant, decodes it and returns it. The code does cache the value in a static variable so that the decoding occurs only once. For each mangled string literal, a new line gets added to the beginning of the method, storing the value in a static variable, decoding it alongside. The code that used the string literal gets changed to reference this new variable. static s_Quit as String = DecodeBase64("UXVpdA==").DefineEncoding(Encodings.UTF8) ' "Quit"
While this example uses only the rather easy-to-decypher Base64 encoding, you are free to choose your own encoding and decoding methods, thanks to RbScript. Constants used for lib names of declare statements. Constants referenced in UI elements and other places with the "#" prefix. String literals in code lines that start with "static " (that's how mangled string literals look like). String constants whose name end in _mangled. Constants used as default values in method parameters. Constants used as initial values in properties. Strings literals that are not in actual code but part of a comment. Therefore, all these types of strings won't be offered for obfuscation. To use this feature, open a project in its Project Editor, then choose Obfuscatable Strings from the Project menu. 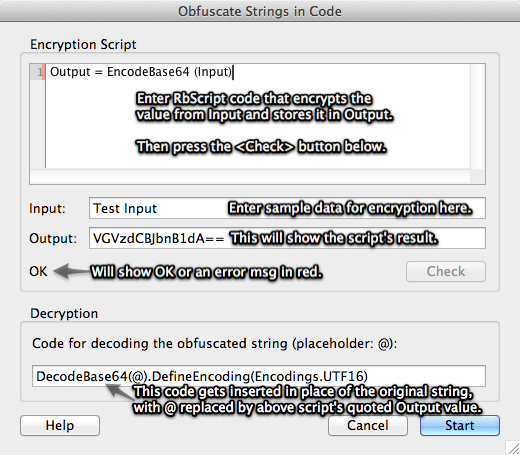 The upper edit field lets you enter a RbScript program that performs the encryption of a string, while the lower edit field provides a function call to perform the opposite. The upper encryption code has to be written entirely in RbScript (you may invoke external shell commands and other tools, though, see below) because it will be executed when pressing the Start button of this dialog. The lower decryption code, though, allows you only to invoke a function. That function you have to add to your project separately. That'll be the decryption function that reserves the upper script's operation. In the above example we're using Base64 "encryption", for which RB already provides a built-in function. You should also remember setting the Encoding of the string back to UTF-8 if the decryption process loses the encoding, because all string constants in Real Studio projects get the UTF-8 encoding by default, and other functions in your project may rely on that fact. Arbed does not manage (save, load) multiple encryption schemes for you. All it does is to remember your last input into these fields. Therefore, you should maintain a separate text file that contains your used encryption script, decryption function call and decryption code to add to your project so that you won't lose it. Also note that because the encryption script and decryption calls are added to the selected strings once you press the Start button, you can even use different encryption techniques in your program for different strings. Due to the fact that the encrypted strings still need to appear in the source code, they need to be valid UTF-8 strings. That means that you cannot return strings that contain an arbitrary set of bytes, because byte combinations are not valid in Unicode strings. Therefore, if your encryption code generates strings that consist no only of readable Unicode characters, you should encode them in a text-only format such as Base64, before assigning it to Output. The script you write for generating your encrypted strings runs as RbScript code. The basic functionality of RbScript is described in the Real Studio documentation. However, these restrictions only apply to lines you write at the topmost code level. If you instead place all your code into a "sub" method and call that from a line past the subroutine, the code inside that method does not fall under the above restrictions. Returns the string to be encrypted. The standard Input(prompt as String) function does the same. Invokes Shell.Execute, returning its Result and ErrorCode properties. Returns "OSX" when Arbed runs on Mac OS X, "Win" on Windows and "Linux" otherwise. Invokes RB's MsgBox(text), but only when using the Check button, not during actual obfuscation (after pressing Start). Should be useful for debugging your script code. returns true if both strings are equal in their binary representation (like StrComp(a,b,0)=0). You can use the following Encode... functions to return encrypted binary data. If you require other operations for the script, contact me and I'll see that I add them quickly for you.